Why Power Wash Your Fence or Deck? No matter where you live, sunlight, wind, and other weather conditions can cause your deck or fence to become dirty, faded, and worn. Additionally, mildew and mold buildup can cause damage that shortens the life of your wood. Regularly scheduled, power washing maintenance can keep your deck or fence looking fresher and lasting longer. Why is Sealing Your Deck Important? Being exposed to the elements, your deck or fence may suffer fading and drying due to exposure to sunlight. 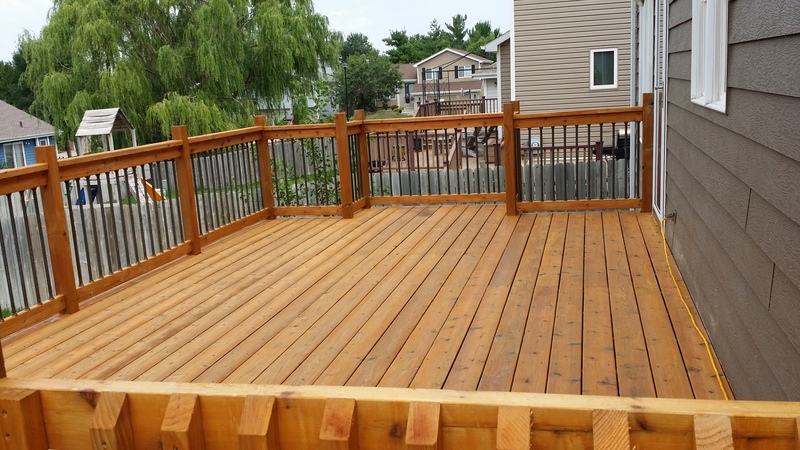 Sealing your deck or fence will not only improve the aesthetic appearance but will also protect and help the wood last longer. Pre-soaking – Using a foam cleaner instead of liquid allows our product to stay on the surface longer so it can be more effective at treating the dirt. The foam softens and penetrates the wood fiber to help lift the dirt away. This non-bleaching, non-chlorine cleaner will destroy the mold and mildew that has taken up residence on your wood. Cleaning – Next we gentle yet effective pressure washing setting to your surface, washing away the dirt and grime while being gentle on the surrounding landscape. Sealing – For our final step, we will apply a mixed polymer sealant to protect your fence or deck from the elements and help to ensure its longevity. At Renew Crew of Lincoln, the safety of our customers as well as the safety of our environment is our number one concern. Our cleaners are environmentally friendly and are safe for you, your family and your pets and since we use a lower pressure setting, your landscaping is safe too! Why Choose Renew Crew of Lincoln? Professional and Friendly Staff – Our experienced and professional staff will see your project through from start to finish to ensure that all your questions are answered. Our Work is Guaranteed – At Renew Crew we guarantee that you will love the work we do, or we will do the job over again. Free Estimates – We offer no-risk, free estimates for your deck or fence cleaning and sealing project. You are not obligated to continue with our services after receiving your estimate. To find out how we can help clean and protect your deck or fence, contact us today at 402-890-1798.